LED lights in recent years have evolved as the most advanced type of lighting technology and are slowly but gradually replacing the conventional forms of lighting systems like incandescent, fluorescent, and high intensity discharge lights. LED lights have become globally popular and enjoy a high level of demand because they tend to illuminate an outdoor, indoor or enclosed space as required without consuming excessive electrical energy and dissipating low level of heat. Of late, LED lights are increasingly being used for stimulating the growth of plants and vegetation in greenhouses and nurseries as well as for herbarium and aquariums. Those types of LED lights that are specifically used in orangery, glasshouses, greenhouses, and conservatories as well as in hydroponics for propagating plant growth are called grow lights. Grow lights are mostly used in climatic zones that do not receive direct rays of the sun during the winter months, and the total number of daylight hours available is just not sufficient for healthy plant growth. Though fluorescents, HID, and incandescent lights can serve as grow lights, none of these types of lighting mechanisms can rival LED lights in terms of performance and efficient use of energy. How Many Watts of LED Grow Lights is Best Suited for Plant Growth? LED grow lights are more costly, compared to fluorescent, incandescent or HID grow lights but since the latter happen to be more energy efficient as well as last longer than the former kinds of lights, the investments are recouped over their lifetime. LED grow lights are available in the entire spectrum of colors similar to the color band of natural light sunlight. 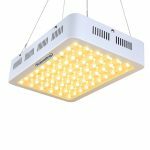 White LED plant lights have been found to be most suitable for all round plant growth and development as the white light reflects the full light spectrum, almost mimicking natural light. How much wattage of LED grow lights will you need to boost plant growth per sq ft of space? 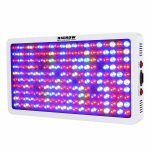 The actual LED grow light wattage needed will depend upon the total grow area, the plant species (flowering, fruits or vegetables), and the growth stage. Typically, for a 1sq ft grow area, 32watts of LED lights would be required. 1. 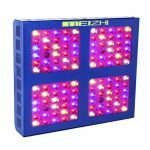 How to Choose the Best LED Grow Lights? The total grow area-The bigger your grow area, the greater will be the number of grow light units that the space will need and vice versa. However keep it in mind that installing the lights side by side will enable you to cover up more room. Plant types-certain species of plants like tomatoes, carrots or cannabis require full spectrum (high light) light while leafy greens can do with low intensity grow lights. The Growth Phase-Will you be needing grow lights only for a specific stage of growth (seedling, budding or flowering) or for the entire growth cycle? Dispersion angle of LED light lens-LED grow light lens with a greater dispersion or scattering angle will cover more area while the illumination from ones with a lesser dispersion angle will be more focused. Your budget-You may have to invest heavily for LED grow lights but you’ll be able to recover your outlay over the lifespan of the LEDs. 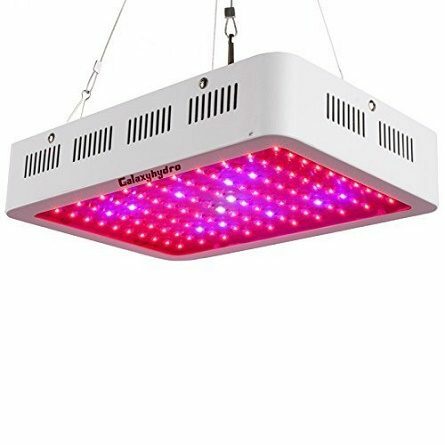 Grow Room Sunglasses-LED grow lights installed in the indoor garden give off high spectrum beams and not wearing protective eyeglasses will in the long run adversely affect your eyesight and may even lead to blindness. Put on sunglasses before entering the greenhouse to safeguard your eyes from the damaging effects of UV rays. 4. How does LED Grow Light Work? LED grow lights are just a variant of the LED lighting systems that are now extensively used in homes and offices around the world. LED lights that are used across greenhouses, nurseries, glasshouses and hydroponics rooms are specially designed for use in these areas. LED grow lights are made up of light emitting diodes, like all other kinds of LEDs. The diodes are sheathed inside a case that comes with a built-in cooling fan and a heat sink. Installing LED lights is extremely convenient as these don’t need a counterbalance or separate component, unlike a fluorescent tube but can be inserted straight inside a socket. LED diodes or simply diodes are semiconductor devices of the simplest type and the conducting material is aluminum gallium arsenide. The light emitting and dispersing diode is usually composed of N- and P-type materials. Since it is a diode (or valve), the flow of electricity is unidirectional. The LEDs emit light that is composed of photons which are the smallest units of light. The amount of energy released by a LED (in the form of light) determines the brightness of the emitted light which is indicated by wattage. So, the higher the wattage of the LED grow light, the brighter will be the dispersed light. LED grow lights are ideal for growing plants indoors as they can emit a light spectrum similar to that given off by the sun as well as providing the appropriate lighting conditions for plant growth at all stages. More Light less Heat-The beauty of LED technology is that LED lights can keep glowing for hours on end without dissipating too much heat. Excessive heat can be detrimental for plants as far as their balanced growth and healthy development is concerned. Lasts Long-Since LED lights use up very low electrical energy for lighting up, they tend to remain functional for years on end. Premium quality LEDs can keep on emitting light for up to 1, 00, 000 hours. Energy Savings-LED lights have become the most popular amongst all kinds of lighting systems chiefly because they happen to be extremely energy efficient. As an instance, replacing high pressure sodium vapor lamps, metal halide or ceramic metal halides with LED lights will reduce energy consumption by approximately 40%. Appropriate Wavelengths-LED lights are capable of emitting light rays with wavelengths that promote photosynthesis in controlled environments. A wide choice of designs-The cultivator or horticulturist has the option of choosing from a wide variety of LED grow lights that are optimal for greenhouse lighting. The Galaxyhydro LED Grow Light has a wattage output of 300 watts and is guaranteed to remain in service for 50,000 hrs. This grow light is what you should be opting for if you’re on a budget. The unit is comprised of 100 Epiled LED chips (each chip is of 3watts) covering the 9-band light spectrum. Though it does not cover the full light spectrum, it furnishes those specific spectrums that are essential for plant growth and development at all stages. The spectrums covered include 430nm, 450-470nm, 620-630nm, 740nm, white light spectrum, and also UV and IR spectrums. These particular spectrums are ideal for stimulating growth right from the seedling stage and make the plants acclimatized for outdoor growth, in case you’re planning to transplant them outside in due course. These LED lights can be used in place of high pressure sodium lamps or metal halide lights with a rating of 250 w and 400w respectively. At the same time, you can look forward to a significant reduction in your energy bills as the lights consume just 135watts of electricity. The Galaxyhydro LED grow lights are ideal for hydroponics, indoor farming and gardening. Plant growth under artificial light is optimum when full spectrum light is provided that mimics sunlight. The Roleadro Upgrade and Newly Developed LED Grow Light 2nd Generation Series emit full spectrum light covering the 420nm-780nm range. This spectrum band is ideal for accelerating the production of sugar exactly in the form required by indoor plants. The grow lights give off beams having a 3500k color temperature that is optimal for each and every stage of plant development. The light rays sent out by the Roleadro Upgrade are very similar to the spectrum of sunbeams, and amplifies the yellow or green light spectrums essential for cell growth and photosynthesis. Two distinct types of LED light lens have been used with dispersal angles of 90° and 120° respectively that not only help in covering up the grow room area but also enable focusing in specific sections. 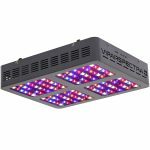 If you’re looking for superlative quality of plant lights for your grow room or indoor garden, then you don’t need to look any further than the VIPARSPECTRA Reflector Series 600W LED Grow Light. This grow light has been specially designed to reflect the full spectrum of light so essential for promoting holistic growth of flowering and vegetable plants right from the sapling to the developing stages. The lights have been fabricated in a manner to maintain the balance between the output and coverage of PAR/Lumens. The VIPARSPECTRA plant lights can be used in place of metal hydride or high pressure sodium lamps with a 600w rating. Installing these lights inside the greenhouse will also lead to a considerable reduction in your monthly electricity bills as these lights consume only 276w. The LED lights are suitable for using in an area measuring 3x 3’ with a height of 24”. The casing houses large aluminum heat sinks and upgradable 4.72” fans. 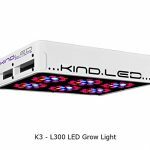 If you’ve a large or a mid-size indoor farm, then choosing the Kind LED Grow Lights K3 L300 will be perfect for you. Comprising a total of 90 individual LEDs each with a 3w chip, this grow light emits full spectrum light rays. The lights have been clubbed into 6 groups, each containing 15 LEDs, for a better coverage and focusing. These LEDs emit the complete 12-band light spectrum that also includes IR and UV light. UV and IR light spectrums are essential for sterilizing and preventing the growth of harmful bacteria that may impede the all round and balanced growth of flora. Additionally, if you’re looking to ultimately transplanting your vegetation outdoors, IR and UV rays can help the plants to become adapted to natural light conditions. 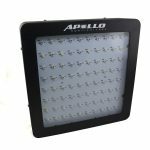 The Apollo Horticulture GL80X5LED plants lights come supremely handy for encouraging the growth and development of plants in greenhouses and conservatories. The grow light has an output rating of 400w and comprises of eighty LED chips each of 5 watts. The light spectrums covered are 430nm to 440nm, 450-475nm, 620-630nm, 650-670nm, 730nm, and the 6500k white light spectrum. Two built-in cooling fans in the casing keep the chips from getting overheated. The plant light is optimally effective for an area of up to 4 x4 feet and has an active life of 50,000 hours. This grow light is suitable for a medium or small-sized indoor plot. 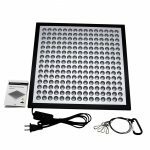 The CrxSunny COB LED grow light comprising a total of 5 incorporated LED chips each of 200w works in a manner that is quite different from the conventional plant light models. The pattern in which the LED chips have been installed inside the casing underlines the terminology, ‘COB’ which in expanded form means ‘chip-on-board’. The purpose for instituting the COB set up is to replicate the spectrum of natural light which is extremely vital for fuelling harmonious development of flora in an indoor setting. 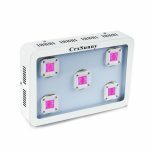 The CrxSunny grow light is one of the best plant lights that you can buy for your indoor farm as the five LED chips work in seamless harmony to emit full spectrum light. An on/off switch and a hanging kit are provided with the package. In case you’ve taken to indoor farming of late and wish to furnish the best care possible to the newly planted seedlings/saplings, then the AeroGarden Ultra LED grow light will come supremely handy. This advanced and smart plant light not only allows you to grow up to a maximum of 7 flowering, vegetative and fruit plants but also lets you keep track of their development via a LCD screen. The user-friendly LCD screen updates you on adding nutrients, water, the age of the saplings, and many other aspects. This 30-watt LED grow light system emits full spectrum light rays that can be fine-tuned for boosting photosynthesis, causing your plantings to develop holistically leading to your reaping a rich harvest. 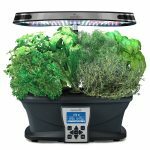 AeroGarden Ultra LED comes with a pod kit containing seeds of basil, parsley, mint, dill, and chives and nutrients for nurturing the seedlings. Raise, breed, nurture, cultivate, and harvest flowering, vegetable, and fruit plants of your choice in your balcony garden with the HIGROW Optical Lens-Series Full Spectrum Grow Light. A total of 200 5-watt LED chips are built into the casing that hangs 24 inches over the grow room with a maximum area of 5×4 feet focusing excellent illumination. Also embedded in the casing are powerful heat sink that together with 3 cooling fans keep the grow light in perfect working order. The 1000-watt grow light reflects rays covering the entire light spectrum in the 380nm-760nm range that also comprise IR and UV spectrums. You can conveniently choose from off channel, full-channel, vegetative channel, and bloom channel for expediting growth at different stages. The newly upgraded KINGBO Reflector Grow Light Panel comes outfitted with 225 LED chips that emit a 6-band light spectrum ranging from 380nm to 740nm, including UV and IR spectrums, ideal for supporting flora growth at all stages. The LED chips have a lifespan of 50,000 hrs implying that they’ll last long after your plants have reached the end of their lifecycles. The plant light not only can easily replace high pressure sodium or metal halide lamps of 1000watts but also help you to save on energy bills as they consume only 35w of power. A robust hanging platform with all necessary installation accessories is supplied for getting the most out of this grow light. Accord the best possible care to your indoor conservatory with the MEIZHI Reflector Series LED Grow Light. The Reflector Series comes with LED light lens inclined at an angle of 120° for focusing maximum illumination evenly in a 3x3feet grow area. The grow light reflects the 12-band spectrum light ideal for hydroponics, sprouting, seedling, budding, flowering, and ripening. The 600w plant light is also extremely energy efficient, consuming just 227watts and can replace HPS, MH, and HID lights of comparable wattage. A total of 10 grow lights were taken up for review and almost all the models met the minimum criterions of a plant light. However, the grow lights from Viparspectra, CrxSunny, Apollo Horticulture, MEIZHI, and HIGROW stood out from the rest. The model from CrxSunny had the highest wattage (1000) but was remarkably energy efficient at 226w, the KINGBO model was found to be most affordable, and the KIND LED grow light emerged as the most performance oriented.